Accelerator card ACA1233n with a full 40Mhz 68030 CPU (incl. MMU). For Amiga 1200 and Amiga 500 with ACA-500 or ACA-500plus. The new ACA 1233n comes with a 40MHz 68030 processor (incl. MMU) in gold/ceramic and 128MBytes physical memory. 1MByte of this memory is reserved for Kickstart re-mapping. The ACA1233n comes with a number of improvements over the predecessor ACA1233. Although clocked at the same speed, performance has been improved in almost every aspect. The ACA1233 boards have much faster memory performance than any other accelerator before - especially with cache and burst enabled. That's because the burst sequence is the fastest-possible sequence that the 68030 can perform: It's a sequence of four 32-bit transfers in four CPU cycles, which has not been shown before we first introduced the ACA1230 in 2010. The result is outstanding performance, even in comparison with other 68030-based accelerators at higher clock rates. The ACA1233 is PCMCIA-friendly: It will not disable the PCMCIA slot, so you can continue to use a networking card in that slot. Memory of the ACA1233n is auto-configuring. This means that all memory is available from a power-up without installing any software on the computer. The old ACAtune tool, which was required for our previous accelerators, is not required any more. If you do not require full speed, the card can be slowed down in order to save power. The CPU governor program will monitor CPU requirement and adapt to the demands of your application, resulting in the best power/performance ratio for your use case. Some software does not like accelerated execution. For these cases, the ACA1233n can be switched off in two steps: The first step is to switch off the 68030 CPU and give control to the CPU of the host computer. On an A1200, you can still use 9MBytes of fast memory, which are also auto-configuring. The second step is to switch off additional memory as well, getting the computer into it's stock state. If used on an ACA500 or ACA500plus, memory can NOT be used by the 68ec000 processor. The clockport of the ACA1233n can either take an RTC module, or the RapidRoad USB host controller. Operation of RapidRoad is 55% faster than with the internal clock port of the A1200 computer. This function is available in all modes of operation on an A1200 computer, and on the ACA500plus. It is not available if the ACA1233n is operated on an ACA500. If software is not compatible with 32-bit memory, Z3 autoconfig or newer Kickstart version, the ACA1233n allows downgrading to Z2 autoconfig, older Kickstart versions and also lets you switch off the so-called "trapdoor memory area". The MapROM function is even available on an A1200 if the 68030 CPU is switched off! This will let you use different Kickstart ROM versions without opening the computer and exchanging ROM chips. 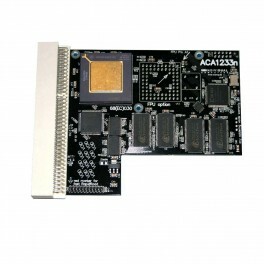 Last not least, the ACA1233n features a new A1200 motherboard interface. Some A1200 main boards have been delivered with the wrong timing components and require modification for reliable use with accelerators. With the new improved interface, the ACA1233n is less likely to require these board patches. Although this has been tested extensively, timing patches may still be required. Timing issues have other negative effects, too. AMIGAstore offer a Timing Fix Service to solve these problems. Transfer method for the ACA 1233n Library and Tools to your Amiga (this software is available as option in a 3,5" floppy disk). Processors on this card are "new old stock": No pulls!